Every summer, flip-flops are always in demand and never go out of style. Flip-Flops lovers sport their favorite Havaianas as they travel to their favorite summer destinations, stroll in shopping malls, or just bask in the sun. Summer is a great way to have fun with friends and family around. Havaianas, the world’s favorite flip-flops and summer brand, celebrates summer anytime of the year. The Havaianas “Always Summer” campaign reminds Filipinos that they don’t need to wait for the season to rejoice in its spirit. Summer never ends and we all have to be happy all the time. “Havaianas is committed to bringing summer to every Filipino. And that is why we’re spearheading a year-round celebration of summer—a season when some of our best memories of happiness and kindness are made,” says Anne Gonzalez, Managing Director of Havaianas Philippines. 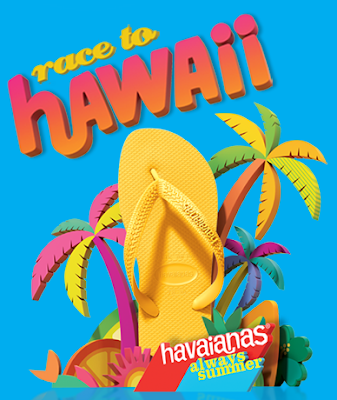 As part of its year-long summer celebration, Havaianas is launching the Havaianas “Always Summer: Race to Hawaii” contest. Flip-flops lovers nationwide can compete in a day of exciting summer fun by purchasing two pairs of Havaianas and winning a slot in the race. Winners in the regional leg will proceed to Boracay – all expenses paid – to compete in the final leg for the ultimate prize: a trip for two to Hawaii - the land that inspired Havaianas. This exciting and unique race is only the beginning for Havaianas. “This is our way to achieve our vision of sharing summer with all the flip-flops lovers who never forget to wear their favorite Havaianas as they play, travel, and indulge in fun-filled activities.” says Gonzalez. The Havaianas “Always Summer: Race to Hawaii” contest is a unique race that will challenge two-member teams to celebrate summer nationwide via summer tasks. The winners of the regional leg will be flown to Boracay for the final leg to compete for the ultimate prize: an all-expense-paid vacation for two to Hawaii – the inspiration for Havaianas (Havaianas is Portuguese for “Hawaiians”). Filipino residents who are 18 years old and above, are fit to travel and engage in physical activities, are eligible to join the Havaianas “Always Summer: Race to Hawaii” contest. Any single-receipt purchase of two (2) Havaianas pairs from any participating Havaianas retailers from February 4, 2011 to March 27, 2011 will merit one (1) Race to Hawaii scratch card, which contains a unique code that the participant can use to register in the www.havaianassummer.com website. Participants have until March 28, 2011, 11:59PM to register or add codes. Participants only need to register once to get a chance to win awesome prizes and gadgets from Sony, David & Goliath, Hawaiian Tropic, and Havaianas in the weekly raffle draw, as well as an exclusive slot in the Havaianas “Always Summer: Race to Hawaii” contest. Weekly draw dates are on February 11, 18, and 25 and on March 4, 11, 18, and 30. Undrawn entries will still be eligible the following week, and additional codes will be considered as additional entries for the weekly draw. Participants will be contacted starting March 30, 2011 to confirm their participation. Participants must confirm their participation or forfeit their slot in favor of the next raffle winner. All participants from outside Metro Manila will be flown in to enjoy the race – all expenses paid. The Havaianas “Always Summer: Race to Hawaii” regional leg will take place on April 9, 2011 at 6:00 AM at the NBC Tent, Bonifacio Global City, Taguig City. All participating teams will receive a special Havaianas gift pack upon registration at the venue. Teams must complete a series of fun summer-oriented tasks and those who finish the race will receive a premium gift pack from Havaianas. Twenty (20) two-member teams verified to complete the race with the best time will be flown to Boracay, courtesy of Seair and The Tides Hotel Boracay, to compete in the finals leg for the ultimate prize: an all-expense-paid vacation to Hawaii. All twenty (20) teams must compete in a series of fun, summer-oriented tasks in Boracay to finish the race. The team with the best time wins the competition, and will fly to Hawaii to enjoy sunshine in a once-in-a-lifetime summer vacation. To know more, visit Havaianas Summer website.